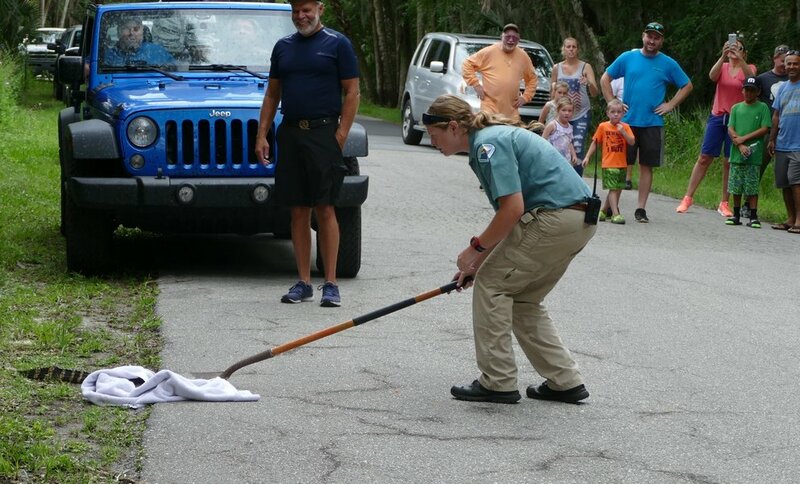 For those who work at Myakka River State Park, I'm sure it requires its employees and volunteers to wear many "hats" as they interact with the public and wildlife. No doubt it requires a lot of patience, a lot of hard-work and a devotion to maintaining a safe environment for the wildlife and the many visitors who come to experience the Magic of the Myakka Kingdom. For those who come to the park, most come to see the alligators and if something unusual should occur during their "adventure" in the park, it certainly is something for the Book of Memories. Saturday afternoon many people were able to add one memorable experience to their Book of Memories. It didn't involve one of those oversize alligators that becomes a YouTube star overnight. Instead, it involved one little alligator hoping to get across the road. There were no crosswalks, no streetlights to ensure the little one's safe passage. Instead, cautious drivers making their way slowly through the park spotted the little guy and immediately stopped to ensure other drivers would also notice and wait until the little one cleared the road. He had apparently decided that the road made a nice warm surface on which to rest and was taking his good old time getting across. When one visitor "explained" to the alligator that it was not safe to slumber on the road, it obviously was not something that the little guy wanted to hear. By this time, more and more vehicles had stopped in both directions, all to ensure that the little guy would not accidentally be hit...that he would be safe. Soon two people who volunteer with the park arrived to "encourage" the alligator to continue his journey and find a better spot elsewhere. Armed with a shovel, one volunteer was hoping to "herd" the little one in the direction of safety BUT the little guy wanted no parts to that idea. Maybe he thought he was going to be put to work clearing trails or ditches. Whatever he thought, the little guy was staying put and to show everyone that he meant business, he "voiced" his disapproval to all who would listen and then plopped down for his "sit-in" demonstration. By this time a young lady who is one of the park's Rangers showed up. She asked that all stay back, that she could "herd" the little guy in the direction of the woods. The Ranger gently nudged the little guy but this little guy wanted no parts to anyone telling him what to do. The more he was "encouraged," the more he dug in his heels and did what any 2-year-old having a bad day would do. I fully expected him to start screaming, "NO! You can't make me. I wanna staaaaay!" Again, the Ranger was persistent. She gently and continually nudged him in the direction she wanted him to go. When this didn't seem to achieve the expected results, the next ploy was to use a bath towel to "herd" the little one. Where you would think this might be less threatening than the shovel, the alligator must have thought he was going to get a bath because he wanted no parts to the towel. He "attacked" the towel and his movements tumbled him off the road and into the grassy area! Voila! Problem solved?? You would think. Throwing the towel on top of the alligator HAD temporarily confused him but he was an obstinate soul. Once he untangled himself from the towel, the little guy was once more ready to re-claim his piece of that road. Not to be thwarted in her attempt to keep the alligator safe, the Ranger assumed her best goalie-stance, blocked the little one's dodges, and steadfastly maintained her vigil. It was at that time another Ranger arrived and she asked that everyone clear out, that our presence was making the alligator too aggressive. She said that the little one would be relocated to safer area and it would be best done without an audience present. Everyone cooperated. Vehicles were cleared out of the area and I assume the little one is now safely tucked away somewhere talking about that strange experience he had when all he wanted to do was to get across the road. For those who work in the park and who have to patiently deal with the public, thank you for your kindness and the modeling you give to children about possible career paths to follow. You did a nice job with the little one! Fresh, new faces at Myakka! The past year has been a bitter-sweet one at Myakka. We’ve said good-bye to veteran members of our team, yet on the sweeter side, welcomed new ones. One of our newest rangers is Rebecca Armstrong who began her time with us last fall. Rebecca is a Florida native and graduated with a Biology degree from the College of Agricultural and Life Sciences at the University of Florida. Her experience in the field includes volunteering for Ocala National Forest, FWC and the Minnesota US Fish and Wildlife Service. When I asked Rebecca what drew her to Myakka River State Park, she immediately responded that it was the massive amount of natural resources that we have. With 54 square miles of land, she definitely came to the right place! One of the requirements for her position was that she pass a physical fitness test mandatory for our prescribed fire program. The test requires the completion of a two-mile walk, carrying a 25 pound back-pack in less than 30 minutes. With little time to practice, Rebecca passed with flying colors! When she has down time, she loves do-it-yourself-projects at home, hiking and playing with her dog, Wesley. We are delighted to have Rebecca as part of our Myakka family. She is a motivated, clever, friendly addition and we look forward to working with her for years to come.